The Inspections and Code Enforcement Department is responsible for the enforcement of the City of Kenner Code of Ordinances, the review and issuance of building permits of all structures within the City, conducting inspections, licensing of tradesmen and issuing occupational licenses. In cooperation with the Planning Department, the Department of Inspections and Code Enforcement is responsible for the enforcement of the City's Comprehensive Zoning Ordinance and also makes recommendations for text amendments when appropriate. One of the Department of Inspections and Code Enforcement's main objectives is to fight blight within the City of Kenner. With the cooperation of the City Council and the Mayor's Office, this department is responsible for facilitating code sweeps throughout all districts of the City of Kenner. An important notice to Kenner residents for Flood Protection Information. For additional flood hazard information, you may go to www.fema.gov. Elevation Certificates - Copies of elevation certificates can be obtained from the Permitting Office located at 2000 18th Street, Kenner, Louisiana 70062 or you can call (504) 468-4062 or (504) 468-4063. Hours of operation are Monday through Friday, 8:30am to 4:30pm. On Sept. 20, 2012 the City of Kenner adopted an Abandoned Property Registration Ordinance. The City of Kenner recognized a drastic rise in the number of abandoned and vacant properties and that vacant properties are in violation of multiple aspects of state law and local ordinances. Specifically, the presence of vacant and abandoned residences can lead to neighborhood decline, lower property values, and can create unattractive public nuisance. This Ordincance requires owners of properties, banks, and other entities to notify the City of Kenner when a property is foreclosed upon, and to provide a local contact person to maintain the property, and to work with Code Enforcement to correct code violation issues. The Ordinance goes into effect on November 15, 2012. The forms required for registration are available by calling the Department of Inspections and Code Enforcement, Office of Occupational License at 504-468-4064. Any questions regarding the new law should be directed to the Department of Inspections and Code Enforcement by calling 504-468-4064. Click here to download Property Registration Form. Click Here to download Notice of Removal Form. The Inspection and Code Enforcement Department is responsible for processing permit applications for building construction and renovations, business signs, demolitions of structures, garage sales and the like. Other responsibilities include issuance of tradesman licenses (electricians, plumbers, mechanical contractors), collection of related fees and coordination of inspection schedules. This section includes personnel that are responsible for reviewing commercial and residential plans to insure compliance with the City's building code and other related regulations. The Permitting Office is located at 2000 18th Street on the first floor of the Annex Building or you can call (504) 468-4062 or (504) 468-4063. Their hours of operation are Monday thru Friday, 8:30 a.m. to 4:30 p.m. PLUMBING LICENSE: cost new $200.00, valid for 1 year, renewal cost $75.00 Delinquent fee $30.00 Revival fee $75.00(must have current State Plumbing License). If you have any questions regarding these fees please contact our office at 468-4062. For renewal and filing forms please see link below. MECHANICAL LICENSE: cost new $200.00, valid for 1 year, renewal cost $75.00 Delinquent fee $30.00 Revival fee $75.00(must have current Jefferson Parish License or State Mechanical License). If you have any questions regarding these fees please contact our office at 468-4062. For renewal and filing forms see link below. GAS LICENSE: cost new $200.00, good for 1 year, renewal cost $75.00 Delinquent fee $30.00 Revival fee $75.00(must have current Jefferson Parish License or State Mechanical License). If you have any questions regarding these fees please contact our office at 468-4062. For renewal and filing forms see link below. BUILDING PERMITS: necessary on all construction, including pools in and above ground, all portable or prefab buildings, cement work and fences. Cost varies, see attached. Please be advised that the demolition of any building must be permitted. Cost varies. SPECIAL EVENT/GATHERING PERMITS: All special events (i.e. bingos, raffles, etc.) must be permitted. The City's Humane Officers have the responsibility of enforcing all humane laws as stated in the Comprehensive Code of Ordinances. The humane officers are vested with the authority to issue citations for violations of applicable regulations. Inspections must be conducted in order for facilities to receive an Animal Control Permit. They also conduct annual inspections of pet shops, kennels and stables. The officers respond to citizen complaints and assist the Kenner Police Department when requested. ANIMAL CONTROL PERMIT: cost $50.00, valid for 1 year, click here to download the application. Provides inspection of motor vehicles registered in the City of Kenner for issuance of annual mechanical inspection sticker. Vehicles are inspected for compliance of applicable State and City requirements. Also regulates vehicles for hire operating within the City. For hire vehicles are inspected semiannually to determine the general condition of the taxicab with relation to safety, and mechanical fitness of equipment. The cost of a brake tag is $10.00 and it is good for one year. After one year, the delinquent fee is $4.00. The requirements for obtaining a brake tag is a current driver's license, current vehicle registration and current proof of insurance. The Brake Tag Station now provides a waiver of vehicle certificate fees for Disabled Veterans, Medal of Honor and Purple Heart Recipients. He or she will have to produce adequate proof of their status at the time of application for the Certificate and shall be entitled to the waiver for no more than one vehicle. The fee of six-dollars ($6.00) is hereby waived for persons holding this status. The cost for the Taxicabs CPNC is $100.00 and it is good for one year; however, the cost of a CPNC obtained after August 15th is $50.00. All CPNC's need to be renewed at the beginning of the year. Driver's permits are due on the driver's birthday at a cost of $25.00 and it is valid for one year. Taxicab inspections are required twice a year, during April and October at a cost of $10.00. These inspections are valid for six months. 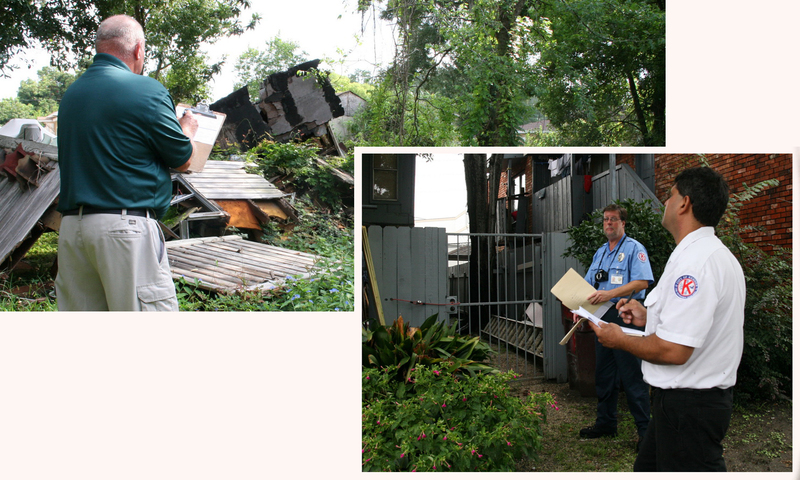 Comprised of building inspectors and municipal code enforcement officers. Building Inspectors are responsible for inspections of buildings under construction as well as existing structures. Municipal Code Inspectors are responsible for the enforcement of more than fifty (50) laws and regulations contained in the Comprehensive Code of Ordinances as well as enforcement of regulations outlined in Kenner's Zoning Text. Dispatches complaints and assignments to building inspectors and code inspectors and other city departments. Processes and records citizen complaints. Maintains and updates property data files. Maintains files relative to all statistical data complied in the department. This section is responsible for the issuance and collection of fees for all businesses including home based businesses operating within the City of Kenner. The cost is predicated on the type of business in operation. This section is also responsible for the licensing of all Alcoholic Beverage Outlet permits. If a business sells any kind of alcoholic beverage, they must obtain a permit from the City of Kenner, as well as with the State. A Class A permit (consumption on the premises), for the sale of alcohol is $500.00, $35.00 for beer, and $30.00 for wine. A Class B permit (packaged), is $500.00 for liquor and $35.00 for beer. License approval takes approximately 7 - 10 working days. You will be notified by phone once the approval process is complete. If you are downloading the application or affidavit, it has to be on legal size paper.